HABIT: Clusters of creamy white flowers in fall. 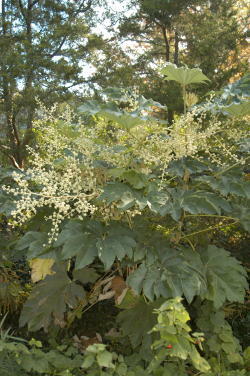 Shrubby but striking, with large 1’-2’ leaves, dark green on top and whitish beneath, tan trunk. Spreads underground and can become invasive. CULTURE: Easy to grow in any soil. PROBLEMS: Fuzz on the leaves is irritating to eyes and tender skin. Can become invasive. This information comes from the Dirt Doctor's newest book, Texas Gardening - The Natural Way. CLICK HERE to purchase.